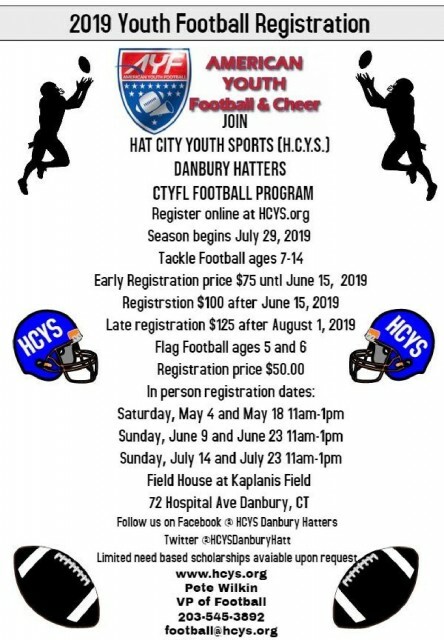 Updated Sunday April 7, 2019 by Danbury Hatters - Hat City Youth Sports. Registration is now OPEN for Fall programs! 5 weeks beginning May 11th in Wilton, CT. Tournament at end of Season. Danbury will play against: New Milford, Wilton, New Canaan, and Woodland/Prospect. Danbury’s AYF, Connecticut Youth Football League Program!